The size of the Aldabra Tortoise varies, but males average 47 inches and 110 pounds. The largest recorded was 59 inches and 800 pounds.The shell is high domed and a uniform dark gray to black. The Aldabra tortoise along with the Galapagos Tortoise are the two largest species of tortoises in the world. The range of the Aldabra Tortoise is the northern part of Aldabra Island; Seychelles. The Aldabra Tortoise inhabits very thick low scrub on an inhospitable coral atoll. Incubation: Eggs hatch after approximately 120 days. Aldabra Tortoises have huge appetites that they try to satisfy by 9 AM. To kill a small animal, they allow it to crawl under them and then quickly retract their legs, flattening their prey. They will spend up to 16 hours a day lying in fresh water ponds or mud wallows. They do not swim well but may float. They are able to fast for two to three weeks at a time. They can live more than 100 years. 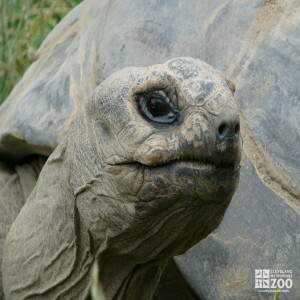 Breeding in Aldabra Tortoises takes place between January and April. Eggs are carried about 10 weeks, but some eggs may be retained for a second nesting later in the year. Because of the apparently dense population on Aldabra, the species is not reproducing in numbers comparable to their population. In the wild, some built-in mechanism seems to be lessening their reproductive instincts because of overcrowding. In captivity there is more reproductive activity when the sexes are put together after having been kept apart than when they are constantly together. Occasionally live animals, mostly a grazer of a wide variety of plant material. Dog food, crushed fruits and vegetables, vitamin/mineral supplements.